Knife Rights Action Alert: Georgia length-limit up for a vote. Please call or write today! It has been a multi-year process to transform Georgia’s knife laws from a patchwork of local restrictions to among the best in the nation. 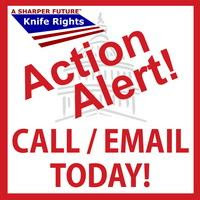 Knife Rights has been there leading every step of the way, and now they are asking for you a bit of help as they seek to change the blade length restriction from 5″ to 12″. Apparently a quirk in Georgia law makes this an easier legislative lift than a full repeal. If you live, work, or travel in the Peach State, please call or email the Senators listed below the jump, and politely ask that they support the bill. ACTION ALERT: CALL & EMAIL TODAY! Knife Rights’ Georgia Knife Law Reform bill, SB 49, that would increase the legal carry length of a knife blade in the state from 5.5 inches to 12 inches, has been sent to the Senate Public Safety Committee. Since I fall into the “travel to Georgia” category, I intend to send the following in an email to the folks above. Feel free to use it as a template for your own correspondence, changing as applicable. I am writing to you as a Tennessean who makes an annual “pilgrimage” to Atlanta each year for the BLADE Show. It is not uncommon for me to be in possession of knives that exceed your legal blade length of 5″, either bringing down myself or purchasing at the show. My TN handgun permit (with GA reciprocity – thank you for that btw) means I am not in violation of the law, but others are not necessarily so fortunate. I am writing to ask you to please support SB 49, which will increase the blade length limit from 5″ to 12″. I feel that this change is important to ensure that honest and otherwise law-abiding citizens do not inadvertently run afoul of this restriction. I thank you for your thoughtful consideration in this matter. Please call or write today. Let’s get this done. this bkog includes aamazing and genuinely excellent stuff for visitors.